Remember that special teacher in your life, who really helped you blossom? 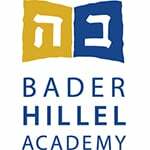 Well, Bader Hillel Academy has a whole staff of them. A good administration and a thoughtfully planned curriculum are necessities, but they cannot compare to the impact of an excellent teacher. Hillel’s instructors have the passion to see the unique spark in each child and help them on their way, beyond their perceived boundaries. There are over a dozen kinds of intelligence, and no one is an expert in them all. Our teachers care enough to recognize each student’s strengths and teach them in a way that helps them excel—even in their most difficult subjects. Each child comes to see how multi-dimensional learning is, and how the various areas of study interrelate. The results are undeniable: Hillel has some of the highest test scores of any elementary school in the area, but the real truth is in connections that our students share with their instructors. Ask any Hillel alum to tell you about Rabbi Levine, Mr. Gutnik, Morah Mishy, or Mrs. Cohen…Our instructors touch the lives of their students, and help create the strong Jewish leaders of tomorrow.